The following article is from the Winter 2012 edition of the Rev. 7 publication. Employing cutting-edge technologies continues to be a game changer for enabling and speeding Bible translation. For years, linguistics and translation experts have recognized the great advantages gained by leveraging the power and speed of computers. As early as the 1970s, innovators searching for effective Scripture translation aids created a “portable computer,” long before one came out commercially. God has continued to raise up technologists who have created applications and built hardware to help language teams do every necessary task: collect language data, analyze it, learn how languages work, create alphabets and primers, and translate God’s Word. Vision 2025 (the year we hope to see a Bible translation project started in every language that needs one) has led our translation teams to change the way they do language work, especially over the last five years. They are seeking to partner with a broader range of people both in and beyond the language communities they serve. We in IT software development are able to support this change because of exciting developments worldwide in technology and infrastructure. One is the creation of low-power devices with simple user interfaces, which is giving rise to a viral acceptance of smartphones worldwide. These phones exist even in very remote locations, including where Bible translation teams are at work. A second major development is the increasing spread and availability of the Internet. And third, the electronic publication revolution. This combination of new technologies now allows us to harness the help and input of the language communities in which we work—in three major ways. First, low-cost computers and tablets, which use low-power and advancing solar-power technologies, can be used easily by non-technicians in remote settings. With these technologies, accompanied by simple and customizable user interfaces for our software programs, we are now engaging computer novices in tasks necessary for language development and Bible translation (see page 4). Second, technologies like “distributed version control systems” enable large teams that are separated geographically to work together in collaborative ways—with or without the Internet, thanks to usb flash drives or local networks. Now language speakers in diaspora can participate in the language work from anywhere in the world. We are also experimenting with enabling the “crowd”/“cloud” (meaning almost anyone worldwide who can access the Internet) to articipate in a language project. We’re defining social networking strategies to engage these communities and also evaluate the quality of contributions (see pages 6 and 7). Because electronic publications are so much cheaper, faster, and easier to distribute than paper ones, this option is now feasible. 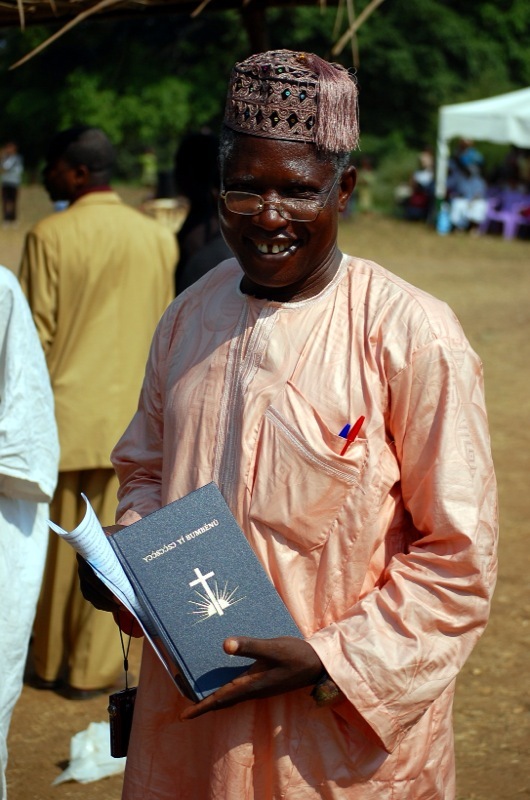 For example, translators can publish Bible stories for their community to read even as they continue working to complete their Bible translation. Or, they can publish separate books of Scripture as they are produced. This allows communities to use what is currently available, as well as offer feedback and suggest revisions. In addition, it builds excitement as they see the results of the language project early and often, rather than several years of work later. For software developers, this is an especially exciting time, as we take advantage of the many technologies that seemingly God has orchestrated specifically to enable language communities to have free, wide, and convenient access to his Word. Mike grew up in the Philippines as a Wycliffe “missionary kid.” He worked as a software engineer in defense aerospace for 15 years. Mike now serves as the SIL International language technology development director and currently lives in Thailand, assessing the impact of software tools used by language teams. The following story is an excerpt from a letter to Wycliffe staff from Bob Creson, President of Wycliffe USA. This was also posted to the Wycliffe USA Blog. Leonard pulled out his French New Testament and showed them that the story was in the Bible. “We listen to this Passion Story every year during Holy Week,” he told them, but they insisted that they’d never heard it before. That, says eonard, is what motivated him to translate the Scriptures into the only language his people could really understand—Yambetta! In the last 18 months, the 35% in rough draft has become 75%, and it could reach 100% within 2 ½ years! Taking into account drafting, checking, testing, and reviewing, The Seed Company calculates that the New Testament is almost 50% done with ALL the steps of translation! A literacy program is also underway, preparing readers for the Scriptures.